Vikki Bird Designs: #knit1000g: Where does all the dark red chunky yarn come from? #knit1000g: Where does all the dark red chunky yarn come from? Most of my yarn stash is there for sensible reasons: a toddler jumper, a baby blanket, a jumper for me, sock yarn in assorted colours and weights for socks (obviously), baby yarn for gifts when people announce they're expecting, a lot of DK oddments that are leftovers from blankets and are destined for toys, blanket squares, intarsia and children's crafts; but there's also quite a lot of dark red chunky weight yarn. To my knowledge, I have never knitted anything is burgundy chunky, so when I decided earlier in week that I was going to make a pair of Bella's mittens in chunky weight yarn for a friend's birthday (having seen my friend Sam's pair) and went to hunt in my stash I was a little surprised to find 500g of dark red chunky weight yarn. It's not the same brand, fibre or dye lot, so it's not as though it can all be used in one project, and I suspect has been purchased on impulse when visiting little yarn shops (although at least one ball was a gift), added to the stash and forgotten about. The mittens require two balls of chunky weight yarn (chunky yarn doesn't go far), and the recipient loves dark red, so I finally have a use for some of this collection in my stash. Fortunately I did have two balls of Hayfield Bonus Chunky in the same shade (876, which I believe is called Firecracker, but is discontinued, and may have been for some time) and dye lot, and I know the person these mittens are for would prefer something machine washable and easy care, so I cast on immediately. The pattern is not the best written: the instructions are all there, and in the right order, but some stitch counts occasionally would be nice, and it's a freebie, so I can't complain too much. I whizzed through the first mitten, getting the whole thing (minus the thumb) done in one evening. 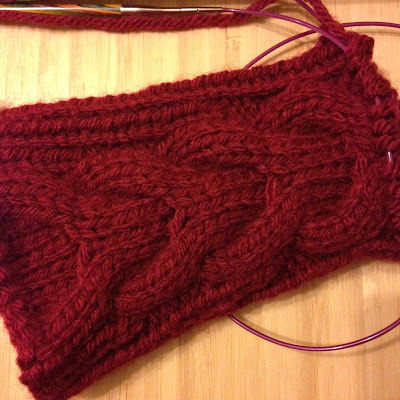 I started off working the cables without a cable needle, but for the second half of the first mitten, when I was a bit tired, it was much easier to use a cable needle. Chunky yarn is speedy to knit with! The second mitten took a rather longer as I misread an instruction, missing a decrease, so had to pull back 6 rows (not the easiest thing to do when you're working in ribbing with cables), and when I went to thread the yarn through the final stitches to fasten the tip of the mitten, I somehow managed to get in a tangle and had to unravel another 12 rows to get it to a point where I could easily fix it (at which point it got put firmly to one side and I went to do something else for a bit), but both mittens were done over the course of three days, and they look great (so much so that I might knit another pair in the future, but I will annotate the pattern with stitch counts and highlight the decreases before I do). They're a tad snug on me, but my friend is smaller than me, so I'm sure they'll be fine on her. And that's two balls of the dark red chunky gone; I wonder what I'll do with the rest of it... If you ever see me in a yarn shop clutching a ball or two of dark red chunky weight yarn, remind me that I already have plenty! Does anyone else have a blind spot in their stash? That yarn looks lovely knitted up! My stash is endless leftover sock yarn, from pairs of socks. I have made scarves from sock yarn and that means it's all used up- good for me because I have a weird obsession with finishing yarn; I hate semi balls. But I never seem to have enough to make anything useful. I need a leftovers project!! Actually, it is really nice knitted up. I don't need more chunky weight yarn, but if I did I would consider buying it again. I also hate having semi-balls lying around, I tend to pass them on to other people, and generally keep them out of sight! I have a sock yarn blanket on the go, which definitely deserves its own post at some point, which I enjoy, but it only ever gets worked on in fits and starts.